Mr Samuel Eccles is what in ordinary parlance, is termed a “Manchester man.” His name is also, singularly enough, the name of his native place, he being born at Eccles, at Manchester, in July, 1834. His parents John and Alice Eccles, were religious people, though through illness his mother’s ministry was almost exclusively confined to her home. In early life he enjoyed the privilege of “the church in the house;” preaching services being conducted by such sainted men as the Revs. James Macpherson and W. Inman. He was converted when nineteen years of age in an old barn, where public worship was regularly held. 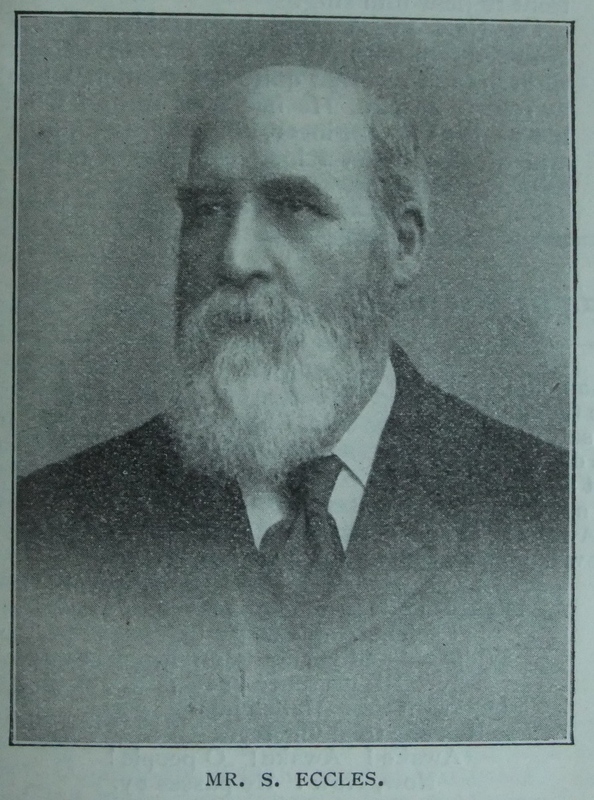 He at once joined the Barton-on-Irwell society in the –then – Manchester Third Circuit. About this time he removed to Liverpool, where he at once sought and found the Primitive Methodists. And at that time it was no easy thing to find them in Liverpool. He, however, discovered some worshipping in a small, unpretentious building down a long passage in Maguire Street. But, primitive as this place of worship was, if figured prominently in the early history of our Church in Liverpool. It was known as the “Glory Hall,” owing to the many wonderful manifestations of God’s power and grace that were witnessed there. Coloured people, engaged in a seafaring life, attended it in considerable numbers, some of whom preached the Gospel with great effect. When in a majority, as these black people sometimes were, they would take the direction of the meeting into their own hands, and would form a ring, and sing and pray with wonderful power and ecstasy. Mr. Eccles was put upon the “plan” by the Rev. James Travis, and straightway evidenced great aptitude and power as a public speaker. His sermons are lucid and practical presentations of evangelical truth, and, being delivered with great freedom and fervour, are much enjoyed by his hearers. His work in connection with “Boundary Street” has been invaluable. He has revelled, as the Great Master did, in open-air ministry, and has preached at almost every street corner in North Liverpool. For this work of open-air preaching he has been specially endowed, possessing a fine physique, an attractive personal appearance, a splendid voice, a ready utterance, a dauntless courage, a rare power of repartee, and, withal, a great love for the work. In the days of the “religious riots” in Liverpool in the years 1861 and 1862, he evidenced not a little of the true martyr spirit, often endangering his life by preaching in some of the lowest slums. On one occasion a crowd of Roman Catholics surrounded him and objected to his singing “There is a Fountain filled with blood, &c.” But he faced his opponents with the boldness of a lion and was slow to desist; but a policeman got to him and begged him for “God’s sake to go into a neighbour’s house or he would be killed.” He was sheltered till after midnight, and then escorted home. At another time he had some of his teeth knocked out, and was kicked by an angry crowd from one end of Tatlock Street to the other. In connection with this episode, Mr. W. Travis, who afterwards entered the regular ministry, and was superannuated at the last Conference, found Mr. Eccles’ hat being used as a football, after which he sought with great anxiety for the owner. Several of the ringleaders of this cruel demonstration were subsequently summoned before the stipendiary magistrate, Mr. Raffles, son of the famous Dr. Raffles, Congregational minister. The witnesses against the persecutors, speaking of each other as “brothers and sisters”, the magistrate naively asked “ if they were all members of one family!” and one named Robinson replied, “Yes, sir, we are all brothers and sisters in the Lord.” The magistrate then suggested, no doubt, somewhat humorously, that “they should try and speak English.” The persecutors were heavily fined, and the riots from that time began to abate. As a class leader his wise counsels are greatly valued, and as a Sunday school teacher and superintendent, and in many other ways, he has shown a real and tender interest in the young. In the Sunday night prayer meeting he is in his glory, and has helped many a seeking penitent into the kingdom of Christ by his earnest prayers, kindly words and inspiring song. As a “hearer of the Word” he is most appreciative and helpful. It is soon known by the absence of his response when he is away preaching. He lives in the hearts of his fellow-worshippers, and his name is a household word in Liverpool Primitive Methodism. He is an ardent Temperance Reformer and a non-smoker. In official metters he cultivates a devout spirit, and is always straightforward and honourable. He has represented his Circuit in District Meeting. Few men have done more to help our Church in North Liverpool than he has by his fifty years of Christian example and constant and in every way admirable service. Though seventy-two years of age, he still preaches with great power, and it is still a treat to hear him sing. On New Year’s Day he presided over a crowded gathering at Boundary Street Church, and received quite an ovation when he rose to speak. He has now retired from his work as an engineer, and we pray for him, and his dear wife, a long eventide of brightness and blessing. Samuel was born in 1834 at Eccles, nr Manchester, Lancashire, to parents John and Alice. John was a labourer. Census returns give the following occupations for Samuel. Samuel married Ann Davies (abt1838-1863) on 27 December 1857 at Liverpool, Lancashire. Samuel married Mary Bannister (abt 1832-1867) on 14 May 1865 at Everton, Lancashire. Samuel married Elizabeth Davies, nee Green (abt1833-1874) on 31 January 1869 at Liverpool, Lancashire. Samuel married Mary Wade (abt1840-1925) in the summer of 1880 at Liverpool, Lancashire. Samuel died on 6 December 1911 at Liverpool, Lancashire.